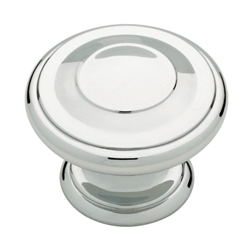 The Harmon Knob features a classic silhouette with refined detailing, there is now wonder surrounding the unmistakable appeal of this knob. Perfect for traditional or casual cabinetry and furniture, crafted from die cast zinc for long lasting quality and durability. For your convenience, installation hardware is included that fits many cabinet applications. Since 1942, Liberty Hardware Mfg. Corp. has built its reputation by offering high quality decorative and functional hardware products at an exceptional value. The company proudly offers its extensive line of hardware products through fine retail outlets and original equipment manufacturer (OEM) distribution channels across the country. Today, as part of the fine family of MASCO companies, Liberty Hardware Mfg. Corp. looks forward to a bright future by continuing to respond to its customers’ needs through unmatched service, outstanding quality, new product development and innovative design. The company’s headquarters are located in Winston-Salem, NC with other office and distribution facilities located in China.